The rapper tapped Mo Bamba to help with the announcement. 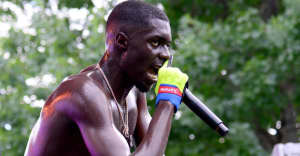 Sheck Wes has confirmed that his Mudboy mixtape will be released on Friday, October 5. The news was announced by the Harlem rapper via a picture of NBA player Mo Bamba in a T-Shirt with the release date on it. The rapper, who is signed to a joint label deal with Kanye West's G.O.O.D. Music and Travis Scott's Cactus Jack, tweeted that the tape is "Mixed Mastered and Executively Produced" by himself. Speaking to The FADER earlier this year, Wes explained what being a Mudboy means to him. "A Mudboy is like a Mr. Solo-Dolo. I’m a Mudboy. It's the hustling stage. It's rising out the mud." Last month Sheck Wes shared the video for his latest single, "Chippi Chippi."